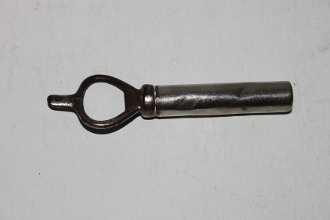 So yesterday on Facebook, an antique dealer mentioned his website and made reference to a miniature folding bow corkscrew that he had for sale. And, given that you never know what other corkscrews someone might have for sale, I visited his site. 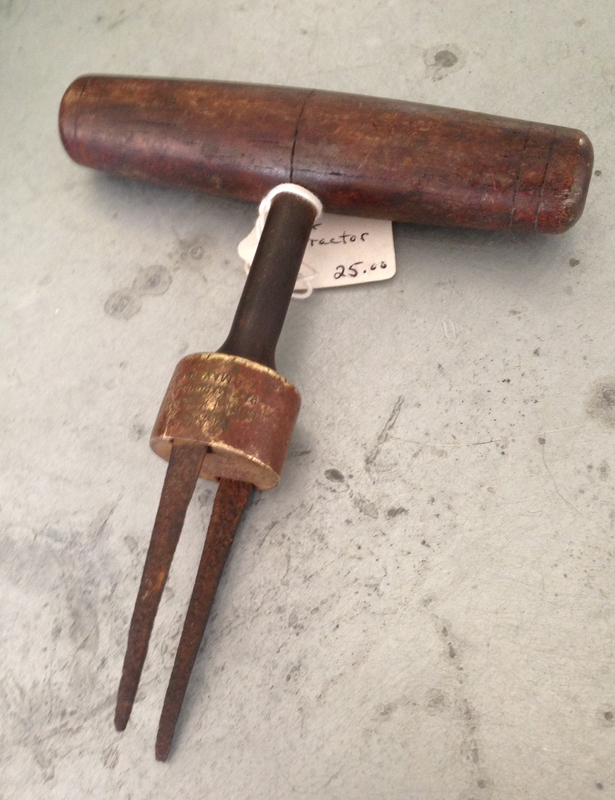 Lots of corkscrews, but many of them a bit out of reach as far as price–a Heeley double lever is priced at $ 300.00. And, many of them more-or-less of the common variety–and those are priced a little more reasonably; a Syroco Waiter for $ 59.00 for example. 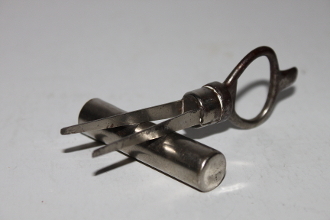 I went through the 138 pictures of corkscrews, and then happened upon the prong pullers. And, there it was, something that I would happily snap up at the price he was asking. And, I didn’t even email to haggle with him, I wanted to simply complete the purchase, figuring others might be perusing the same site. Now, this technically is a double, but it was still lower priced than what I had to fork over when I got my first example on eBay five years ago, and it was seriously lower than what one recently sold for on the recent ICCAuction, with a bidding war that ended with fotodeal taking the cork puller out of the clutches of the desirous underbidders. The prong puller I acquired in 2008 made my best 6 for that year. So, when I see a corkscrew that is slightly different than those that are in the collection, if the price is right, I will often go after it. And, as luck would have it, an unusual looking Curley corkscrew was listed last week on eBay, by none other than Mike Gordon. How is this unusual? Well, in looking at the picture, the bell assist on the Curley he had put up for auction, looks more elongated than others that I have. So, I placed a bid, and ended up winning the auction. 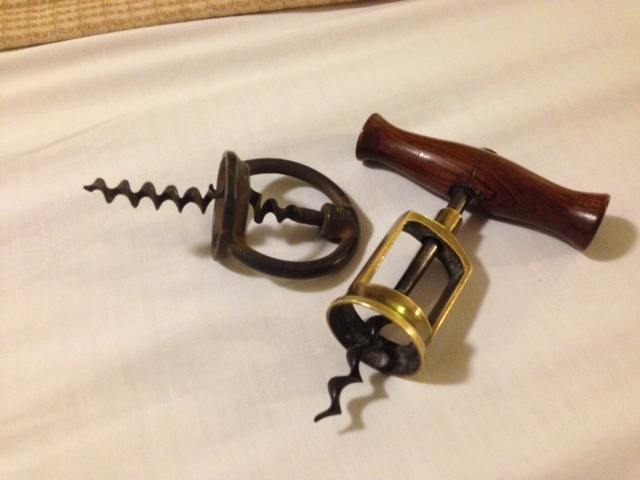 The corkscrew arrived yesterday, and in comparing it with one of other Curleys in the collection, it is indeed very different–the recent acquisition is on the right. Always cool to add another variation to the collection, and soon enough it will be added to the Curley Corkscrew page–which is still in the works. When it is up and running, I will let you all know! This morning, a seller on eBay listed a catalog page from L & C Mayers of New York circa 1937. 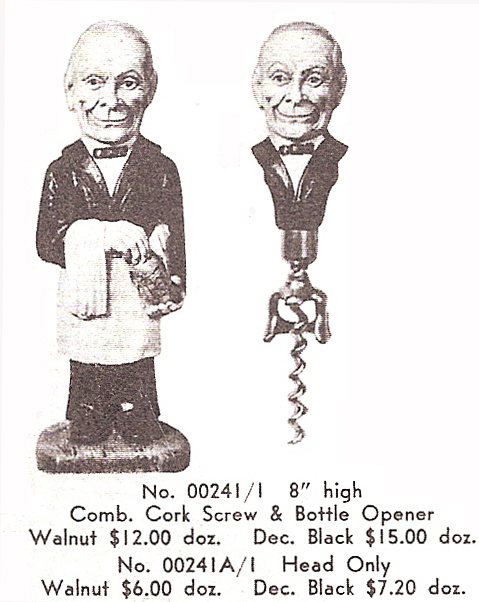 And, on this particular page of the L. & C. Mayers Co. Fifth Ave., New York catalog–illustrated is a Syroco Waiter. 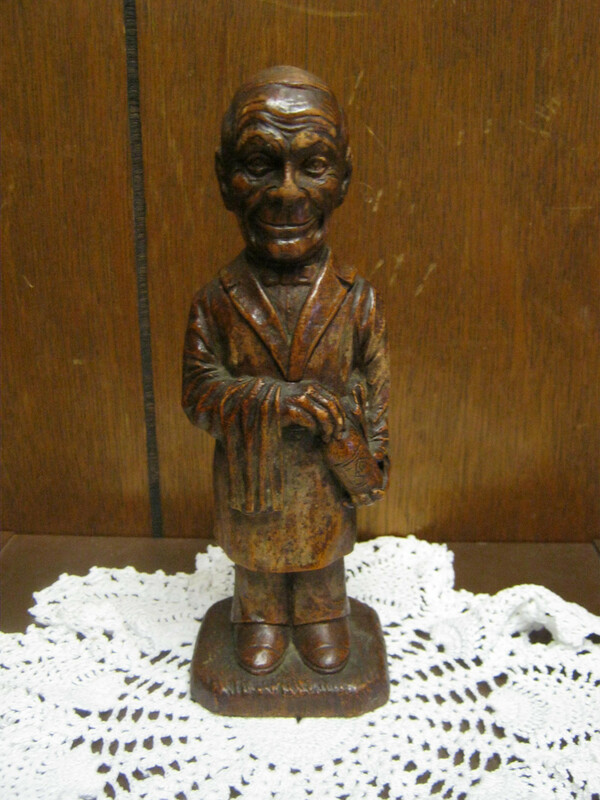 Attractive figure of waiter carved in wood. Colored black, white and natural flesh color. Head lifts out producing automatic corkscrew and bottle cap remover. Novel ornament. Height 8 ¼ inches. At $ 4.00, the waiter would be a nice gift. Of course, if you look at Syroco’s catalogs from back in the day, they were selling them at 15.00 for a dozen if decorated, and 12.00 for a dozen if walnut/stained–$1.25 and 1.00 a piece respectively. Speaking of Syroco Waiters, a nice stained one was listed on eBay yesterday with a fairly low buy it now price. Not that I really need another Syroco Waiter as there are about a dozen standing around waiting for us to open a restaurant, and this example was a bit more than the price as advertised by L. & C. Mayers Co. The lovely bride only told me what I needed to pack, and then whisked me away for a few days for my birthday. Without any clue as to where we were headed, except explaining that we would be headed to the airport, we were soon on our way. Following an evening in Portland and a great meal at Local 188, the next morning we were on a plane to Chicago—of course, flying from Portland often means having a layover in Chicago, so I still wasn’t sure. After landing in Chicago, we started heading to the trains to the city, and it seemed like the city was going to the location for the b-day extravaganza. And, it was! We trained into the city, and then walked several blocks, to Hotel Monaco, where we were greeted like old friends—having hosted the ICCA AGM there last year. Handing over our luggage to the bellman, we headed off to lunch at RL. Lunch was followed by a bit of shopping, and then getting ready for dinner. During wine hour—a complimentary perk at Hotel Monaco—suddenly Tommy appeared. 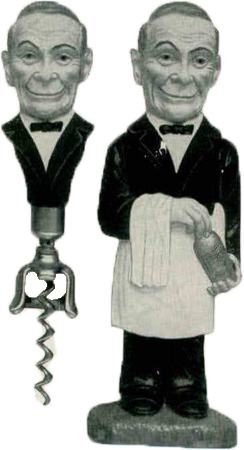 He would be joining us for dinner at Smith and Wollensky, and he brought with him a great little corkscrew gift; the wine otter. 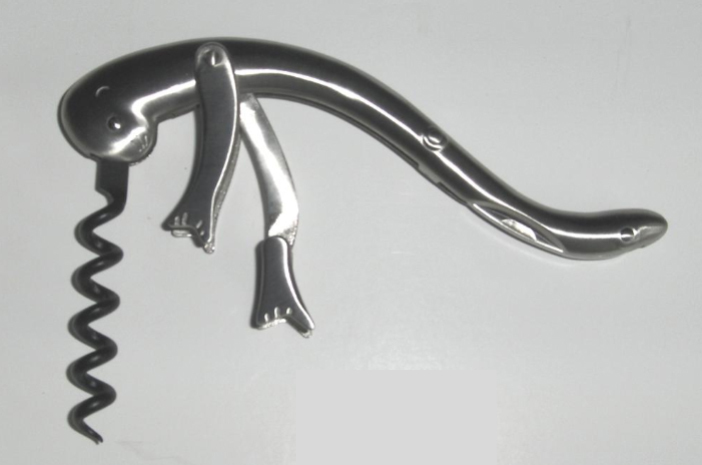 The Wine Otter, is actually a patented corkscrew (circa 2009) but has never been put on the market! A very cool piece to add to the collection. Thanks TC! Smith and Wollensky was fabulous, and it was really fun to reminisce about the ICCA Meeting, catch up with Tommy (not that we needed much catching up, as we were just at Brimfield together), and enjoy Chicago with the lovely bride. Over dinner, I came to find out there were more surprises in store, and Tommy would be picking us up the next day as we were going to spend the afternoon at the Cubs game. Of course, prior to that, the lovely and I needed to go for a run as we are in training for a half marathon, so in the morning we got geared up and headed for a ten+ miler on the lakefront. 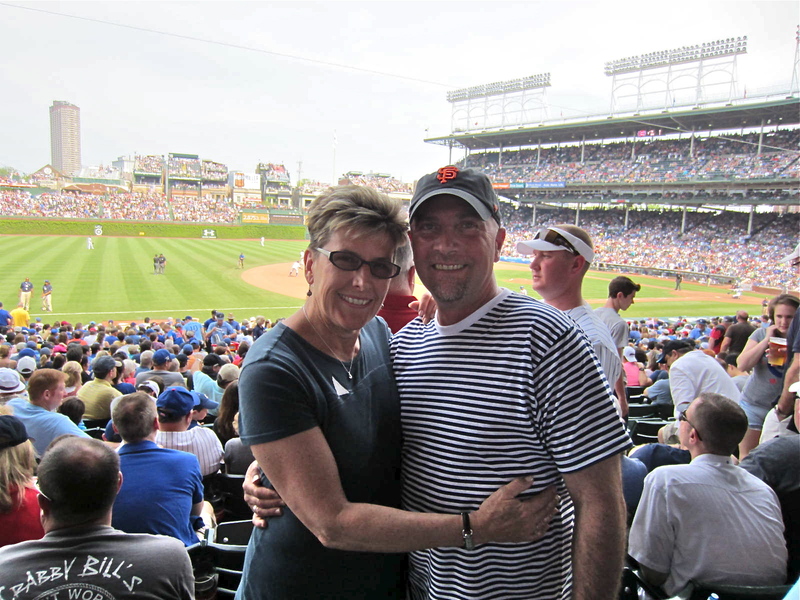 After a couple of much needed showers, TC picked us up at the appointed time, and we headed to our old neighborhood, and walked over to Wrigley. The Cubs lost, but a good time was had by everyone—except the Cubs. Following the game, and a couple of margaritas, we said goodbye to Tommy, and decided to walk the 6 miles back to the hotel spending much time sharing memories of the many years we spent in Chicago. It had been a great birthday adventure, and we would be flying back the next day. Having run 10 miles, and walked a few back to the hotel, we kept our dinner plans relatively close in proximity, and headed over to Bandera—where there is always a jazz trio playing in the evening. The next morning, we did a bit more shopping on Michigan Ave, and then another surprise, as the lovely bride and hired a driver to take us back to the airport. Following our arrival back in Portland, we headed North, but instead of hopping on the boat for home, we instead found ourselves at the Samoset Resort for one last night before heading back to the island. A wonderful couple of days away, and the lovely bride planned this one fantastically (and rather secretively). Now we are home, and back to construction chores. The floors are installed. Most of the plumbing fixtures are installed. I will be installing trim tomorrow, and hopefully we will start painting and doing a little electrical by the end of the week! The lovely bride has been planning a b-day trip for some time, and in a couple of hours we will be heading off island for a Josef’s-Birthday-Adventure! What is really fun about this, is she has kept the entire thing a secret, and I have no idea where we are headed. She is pretty amazing. I will report on the birthday-extravaganza when we return on Tuesday. It could still use a little more tender loving care, but it is beginning to clean up nicely. Now, it is time to finish packing, and then head off to the boat. Thursday morning at Brimfield is certainly more civil, as May’s field opens at 9:00 in the morning, as opposed to daybreak as on Tuesday. And, after packing up and checking out of the hotel, a caravan of vehicles started heading towards the antique show. At first, it was just a caravan of three–Barry, Tommy, and I. But, as we neared Brimfield, traffic got heavier and heavier, and we were stop and go for the last two miles before we could find parking. Not really that bad, given we gave ourselves an early start. Those that were still sipping their coffee, and contemplating a day of antiquing would soon be backed up for multiple miles. As mentioned yesterday, there were a couple of dealers who had suggested a return visit after they unearthed some corkscrews, and one came through. While he only had one that he could find, that Tommy bought, he started to describe, in detail, a corkscrew he has back at his shop. As he was describing it, I grabbed my iPhone and pulled up my website. “I would definitely be interested,” I responded. We talked value/price, and logistics of getting to his shop, but he promised photos of the others that he has as well when he gets back to his place. After our visit with the dealer, we headed off to May’s and stood in line for half an hour while waiting the gates to open. And, when they did, we headed off on the hunt. I hadn’t planned to stay long at May’s, as I had to hit the road, and catch the 2:45 boat. So, after meeting with another dealer who saves his corkscrews for me (sadly he didn’t have any this time), I walked a few aisles, and shortly thereafter texted TC to tell him I was on my way out. Tommy had found some corkscrews at that point, and I passed on a too expensive Anri bar set. I had run into Barry, and he had yet to pick up anything, but I am sure it was only a matter of time before each picked up a few more. I hopped in the car, and made my way back to Rockland where I caught the 2:45 with 20 minutes to spare (in between, the aforementioned dealer called me to discuss a couple of other openers he just found in his van, and promised pictures of those as well). All in all, a successful trip to Brimfield. Good corkscrews the first two days, a good time with Barry and Tommy, and a great lead on a very nice corkscrew with our new dealer friend. This morning we all met at the appointed time, and headed off towards Brimfield. The first new field of the morning opened at 6:00 am, and we were there at the ready. Barry was going to use an alternate entrance, I was going to start on the right side, and Tommy was going to head somewhere where we weren’t. In the first few booths, I hadn’t found much, but picked a 5 dollar t pull, and then a nice Anri terrier figural corkscrew. Lots of overpriced corkscrews were available in this particular field, and I had just about finished the last row of dealers, when I decided to text Tommy to see how he was doing. We hadn’t seen each other since he started of in the other direction. And, his text came back, “Mumford.” Nice find TC! And, with an asking price of 25 dollars, it is a REALLY nice find! As it approached 9:00, we congregated at the entrance of the next field to be opened, and again made our plans of attack. I would head to the left of the field, Tommy to the right, and Barry to the back of the field, and work his way forward. The gates opened, and the guys took off. I on the other hand, simply stopped at the first booth on the left hand of the aisle and picked up a nice direct pull with blade/cutter. I headed down the field, and after turning to the next aisle, entered into a booth where the dealer said, “Its the corkscrew guy.” And, while I was perusing the items, he got up and walked past me and started rummaging through a box. 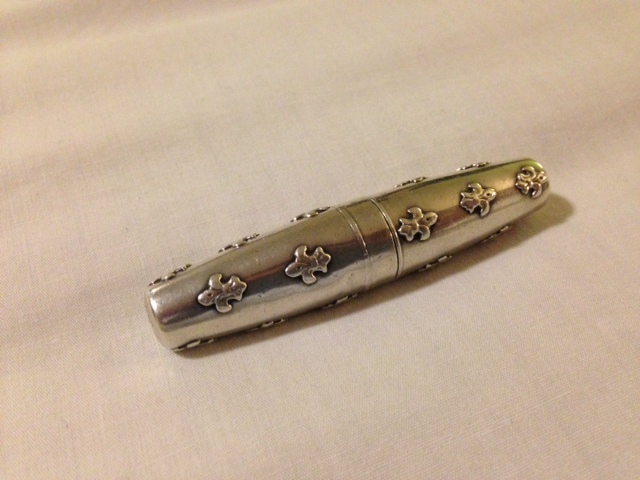 I asked him if I could help him find something, to which he responded, “I have a corkscrew for you.” And, within short order presented me with a lovely La Pierre roundlet adorned with a fleur de lys pattern. After asking how much, and my countering the offer, we met in the middle. I handed over my cash, and I was off to the next booth. 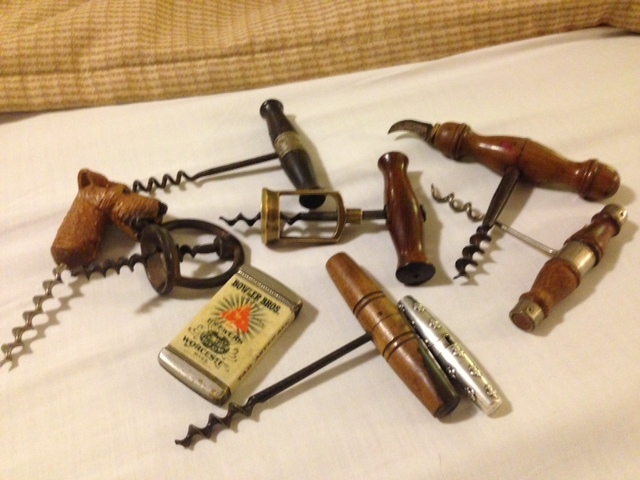 After passing on a few common corkscrews, I then spotted a small case with nice corkscrews within it. When I looked up, I recognized this dealer with whom I have been talking corkscrews for several years. He is a former CCCC member, and had sold off most of his collection, but over the various visits to Brimfield has told me that at the next show, he would bring a few with him. This would be followed by him repeating the same thing the next show, and the next. It seems finally he brought them. There was a very nice Goliath–which is pretty funny given in yesterday’s field there was a very nice Geha. Much like the Geha, the price was a bit much, so I left that one behind but picked up a very handsome British brass frame corkscrew and corkscrew that looks similar to a Plant’s Magic patent (unmarked). Given I had been pestering him to bring the corkscrews for 3 or 4 years now, he was willing to strike a deal for the pair. Shortly I met up with Tommy, and since we hadn’t seen Barry, we headed over to grab a bite to eat, and wait for the third field to open. 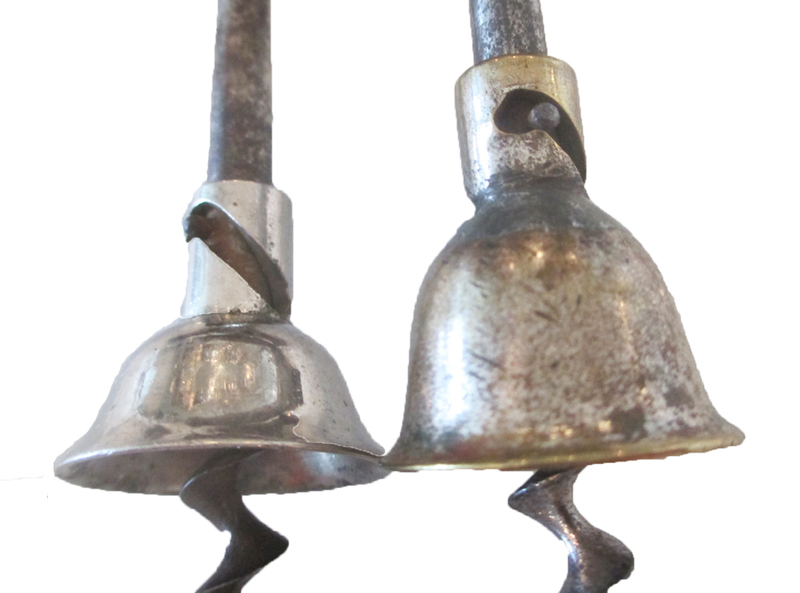 Finally the bell rung so buyers could start buying, and we scurried about asking for corkscrews. Not much in this field, although I did pick up a couple of Haffs. And, as luck would have it I had another conversation with another dealer who had a small box of corkscrews in his van. With sales fast and furious, he wasn’t able to get to them, but promised to hold them for me until tomorrow. That definitely will be my first stop of the day. All in all, a nice day walking the fields of Brimfield. Tonight we will make our annual pilgrimage to the Student Prince to celebrate a successful Brimfield trip, as tomorrow we each will be heading back home. Not before hitting May’s field of course…and you never know what might turn up. Last night, Barry and I headed off to dinner, and as the last round was almost done, Tommy walked into the restaurant, grabbed a captain and diet coke, and soon enough a couple more drafts appeared for Barry and I. We talked to Tommy about his drive, examined a signed CLARK direct pull that I picked up on my drive down, and made plans for the morning—we also debated whether the Clark is really signed or not, as you can make out the C, and a portion of the L and the K, but it is really really really faint. Still, I will go with signed Clark! This morning we met as arranged, and all headed off together to Brimfield. After our arrival, Barry headed right, and TC and I headed left. For the most part, Tommy and I stuck together, checking out booths and hunting for hidden helixes. Several times we headed opposite directions, only to meet up shortly thereafter. And, when this would happen we would share what had been found thus far; a flash, a starr wall mout, a couple of t-pulls, Ebay fodder for the most part. Tommy (and a couple of the dealers) were getting a kick out of my new negotiating technique. I would ask how much, and whatever price they respond with, I simple repeat the price; loudly with a certain disbelief. Thus far, it hasn’t really helped, but we all certainly get a good laugh over it–especially when it is 5 dollars for a flash or similar. At that point, we hadn’t seen Barry since he headed right. And, as we were closing in on the time when Dealer’s Choice was to open, we made our way towards the field. Still, no Barry in sight. We traversed the field at the appointed time. I saw a waiter and codger for 75 a piece–which were purchased by a dealer and repriced in the next field for 125 a piece–and passed on a peg and worm that was a bit over priced. Tommy on the other hand, had texted to say he got a henshall (unsigned) for 10 bucks… Nice! Before Dealer’s Choice opened however, I had picked up a couple of things as well. A signed Murphy T pull, a decapitator Clough, a Sterling roundlet in nice shape, an unusual Aubock key—in aluminum, a Williamsburg brass corkscrew, and a haff patent. Nothing truly spectaular, but the day (and the week) is still young. After grabbing a bite, I met up with Barry and TC. As usual, we compared finds. And, Barry had picked up some nice items. A small white scottie dog with the bell in the tummy for very little, and Perille Perle folding corkscrew—hmmm I guess we should have headed right. As the next field opened, we split up, with me heading right (this time), Barry heading left, and TC heading straight up the middle. There were a fair amount of corkscrews in this particular field, but many of them overpriced. 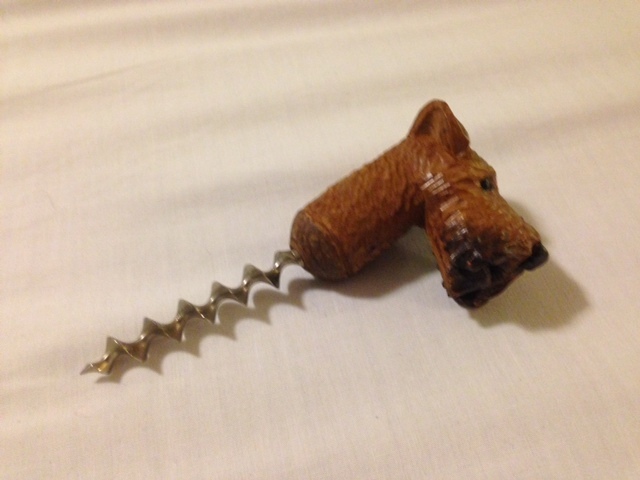 Still, I was quite happy when I happened upon an unusual figural black cat corkscrew, and then three booths later I scored a Bodega—a corkscrew that I have never had before, and for a very fair price. Tomorrow there are three new fields opening, and you never know what might turn up. Stay tuned. Are you driving yet Tommy? 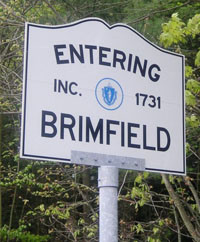 Brimfield starts on Tuesday morning, and Tommy will be driving out to join the usual suspects as we search the fields of Brimfield for corkscrews. But, with TC’s drive taking at least 14 hours, and knowing that he will probably hit every backroad antique store/mall along the way, what should be 14 hours could ultimately be 3 days. Just be sure to be there for the 3 am wake up call on Tuesday TC!! 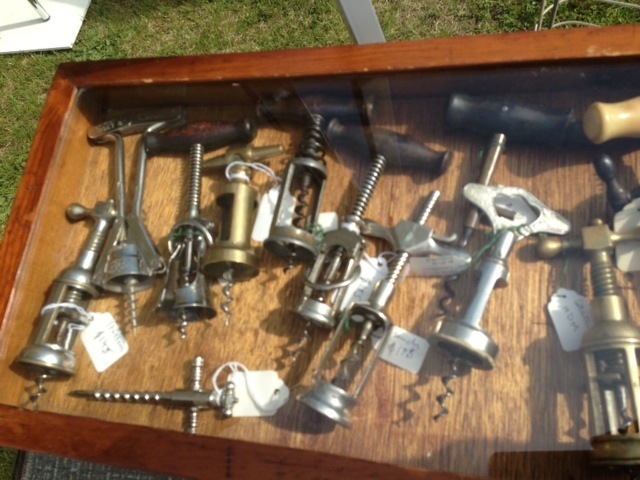 Of course, beyond hunting for corkscrews one of the best parts of the three (and sometimes four) day antiquing adventure is that so many corkscrew collecting friends turn up. Yes, it means there is competition for our coveted corkscrews, but it is always fun to re-connect with friends. The May show at Brimfield is always the most attended, both by buyers and by dealers. 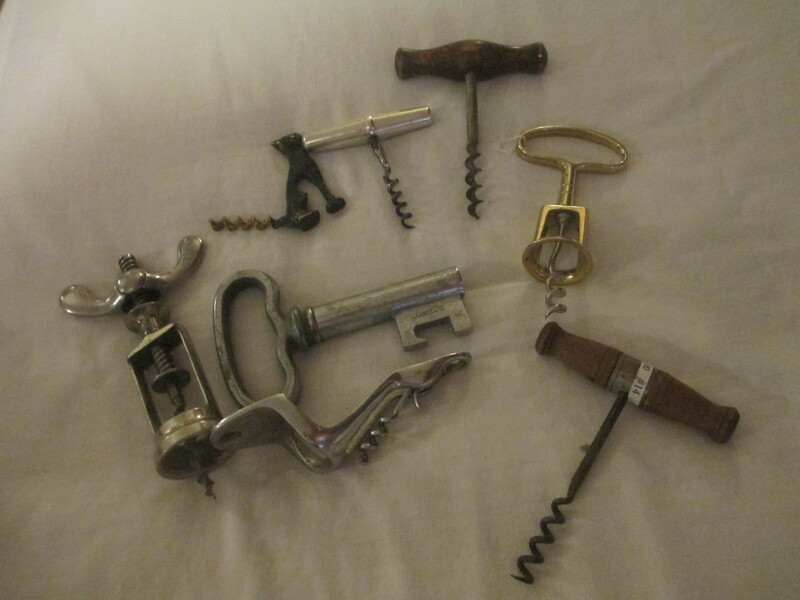 And, there are ALWAYS corkscrews to be discovered. What will be unearthed this time around? I can hardly wait!!! 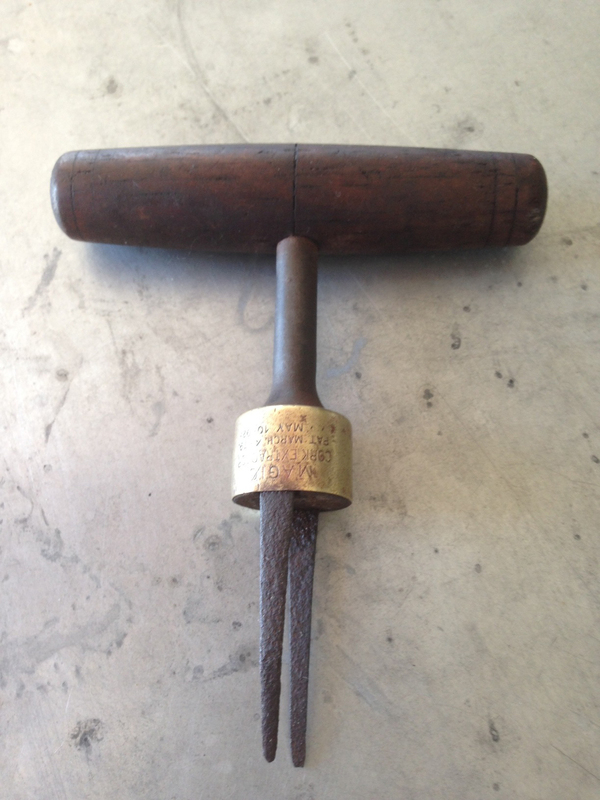 After reading yesterday’s blog, Don Bull emailed with information on The Simplex corkscrew. 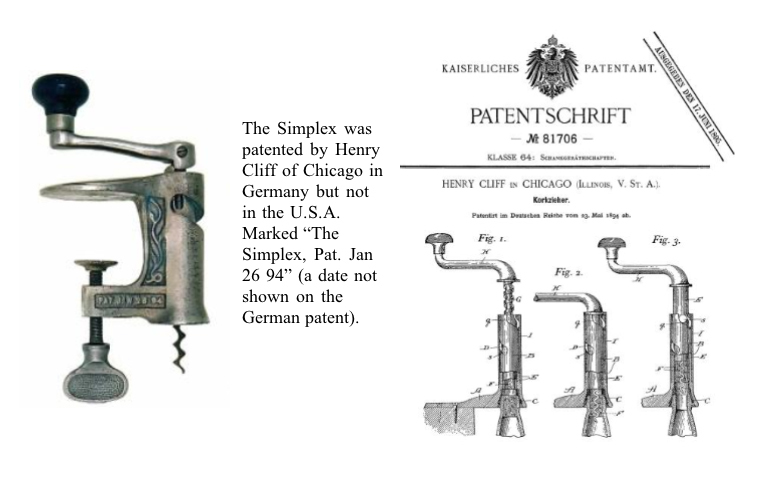 He explained that The Simplex was patented by Henry Cliff (of Chicago) in Germany in 1894–this is something I should have remembered given that it was part of Don’s presentation The Incomplete Chicago Corkscrew Story from last year’s ICCA AGM. For those of you interested in checking out his presentation, it is available on The-ICCA.net website in the Library section. You can link to it here. 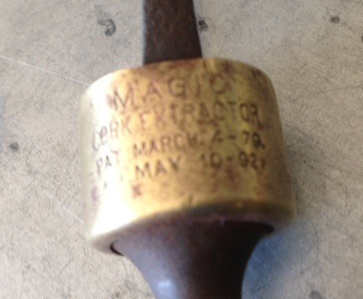 A follow up email from Don explained that The Simplex was also patented by Henry Cliff in England (No. 9,972, May 22, 1894) and again in France (No.238,702, May 22, 1894). 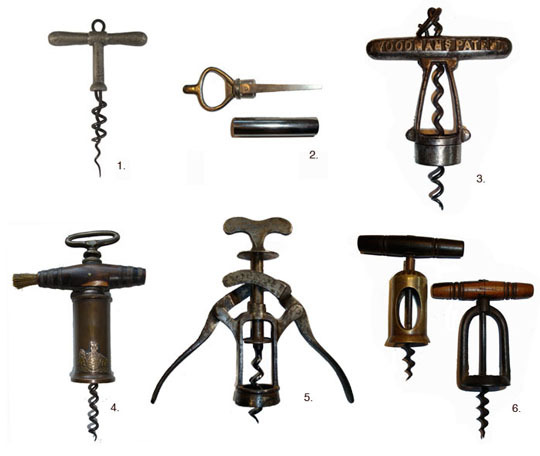 What is interesting is all of the patents are from May of 1894, but the corkscrew itself is marked Jan. 26, 1894…where does this date come from? Surely there is some documentation out there…and, I will continue the hunt! Thanks for the information Don! btw: Brimfield starts in four days!!! !